We can design your small or large project—anything from a logo, business card, brochure, brief, newsletter, annual report, journal, magazine, or an entire book and its cover. We’ll also spec your project and set up the correct style sheets. For some examples feel free to browse our website. XML-first—Word files are converted to XML using a series of semi-automated macros. The resulting XML files are then parsed for tag consistency before being imported into the pagination application. Xtags—Word files are converted to Xtags format, which is similar to XML. We are able to convert almost any file format imaginable, either as input for our own software or as input for your software. We can easily convert from Quark or InDesign to Microsoft Word, HTML, SGML, or XML, in addition to other formats. 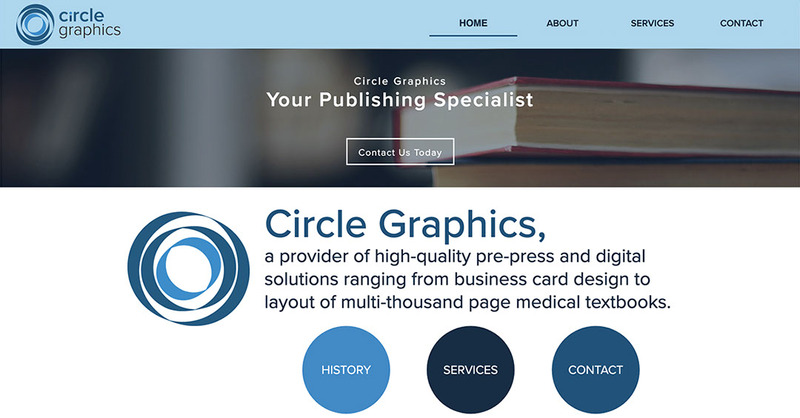 Circle Graphics' talented editorial staff has expertise in all manner of print and electronic materials, including medical books, scientific journals, monographs, technical and instructor's manuals, conference proceedings, reference books, study guides, newsletters, magazines, directories, annual reports, and more. You may submit manuscript in any format from plain hard copy to coded Word files and we will take care of the details. Some clients prefer to code their manuscript with simple tags such as <H1>, <TX>, <NL>, etc. Clients with repetitive books or journals may prefer to use Word Style Sheets such as <Heading1>, <ParagraphText>, <NumberedList>, etc., and other clients simply make written notations on the hard copy. We will accept whichever method you prefer and with which you are comfortable, and can convert your supplied electronic files or keyboard your material from scratch. If you prefer, we can supply a Word template, complete with the appropriate Style Sheets, and instructions for their use. With the traditional method, one person reads the client-supplied manuscript against the typeset pages or galleys and marks any discrepancies using industry-standard proofreading marks. The proofs are returned to the paginators for corrections and then rechecked. In an alternate method, two proofreaders read the same material and both initial the proof. The proofs are returned to the paginators for corrections and then rechecked. This method is theoretically more accurate but costs more. If the client has already proofread the supplied manuscript, our experienced proofreaders can accurately scan the typeset pages for errors without reading the manuscript word-for-word. Circle Graphics uses an in-house Style Guide to supplement guides supplied by our clients or if there is no client-supplied style. This is basically a checklist to ensure consistency throughout a publication and includes items such as number of lines required above or below a heading, number of hyphens permitted at line endings, and other common-sense information to ensure a quality publication. We don’t do indexing ourselves, but we work with several indexing companies that provide fast and reliable turnaround. Confirm that the manuscript, artwork, tabular material, equations, and displayed elements are complete, accurate, and ready for composition. Review copyedited files for adherence to editorial style and perform quality checks at each page stage to ensure that any changes have been made correctly. Manage and coordinate the preparation and tracking of content. Monitor and adhere to production schedules. Alert you to any changes that may affect final cost, schedule, or quality of the finished product; i.e., excessive author alterations, author lateness in returning proofs, art problems, etc. Use judgment and critical thinking in evaluating work and referring queries to the client; i.e., reducing page count, improving text layout, avoiding wasted space. Offer superior communication skills, strong problem-solving abilities, and good organizational skills. Maintain regular contact with client regarding schedules, quality of product, and content. We currently use two of the more popular pagination programs on the market—Adobe InDesign or QuarkXpress, and we have many versions of each, from Quark v3.2 to 9.2 and from InDesign CS1 to CS6. We also have many plug-ins and Xtensions that extend each program’s capabilities. At Circle Graphics, two individual typists usually perform keyboarding and the resulting files are run through a comparison program, which flags any discrepancies. A supervisor or more experienced third keyboarder will then check the manuscript and resolve the differences. We can convert your finished InDesign or Quark document into the markup language of your choice—SGML, HTML, or XML. It’s best if you already have a DTD (document type definition) to define the document structure, but we can always use a generic book or journal DTD. If your publication is currently in Quark, InDesign, or even in PDF format, Circle Graphics can convert your files to the eBook format of your choice—ePub for iPad and Nook or PRC for Kindle. The files will be converted, tagged with CSS style sheets, and QC'd. We check every eBook on the actual eReader device and we guarantee at least 99.8% accuracy.